The liver is responsible for metabolizing various compounds for distribution and activation. The use of 3D bioprinting technology and materials – bioprinters and bioinks- can advance the mimicry of the complex architecture of the cellular organization, vascular branches, and bile canaliculi network. By providing drug metabolism, 3D bioprinted liver tissue models can become the essential platform for drug development. The aim of this project is to investigate HEP X bioink for liver tissue models using human liver cell lines and primary human liver cells. The first aim is to demonstrate that HEP X can be used to bioprint HepG2 (hepatocyte cell line) and the second is to demonstrate that HEP X can be used for primary hepatocytes and stellate cells to 3D bioprint liver models. In our labs, we bioprinted HepG2 in the HEP X-series bioink and cultured for three weeks. Fluorescent microscopy images with Live/Dead staining demonstrates cell proliferation and clustering. With 21 days of culture, the construct demonstrates cellular networks within the 3D construct. 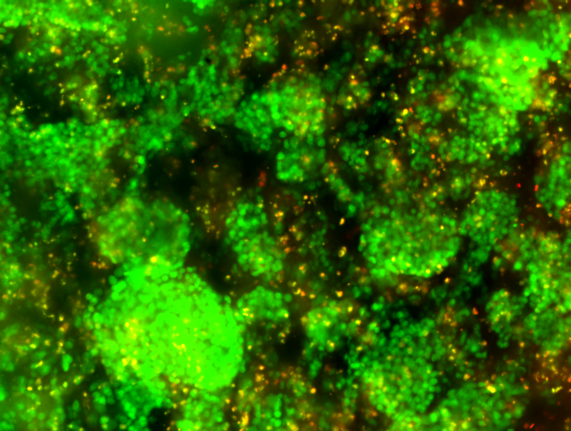 The Live/Dead image beside demonstrates confluent live HepG2s (green) with some clustering and some dead HepG2s (orange) after three weeks of culture. Image taken at 10x magnification. The mRNA expression level of the 3D constructs printed with HepG2 were analysed after one and three weeks in culture. 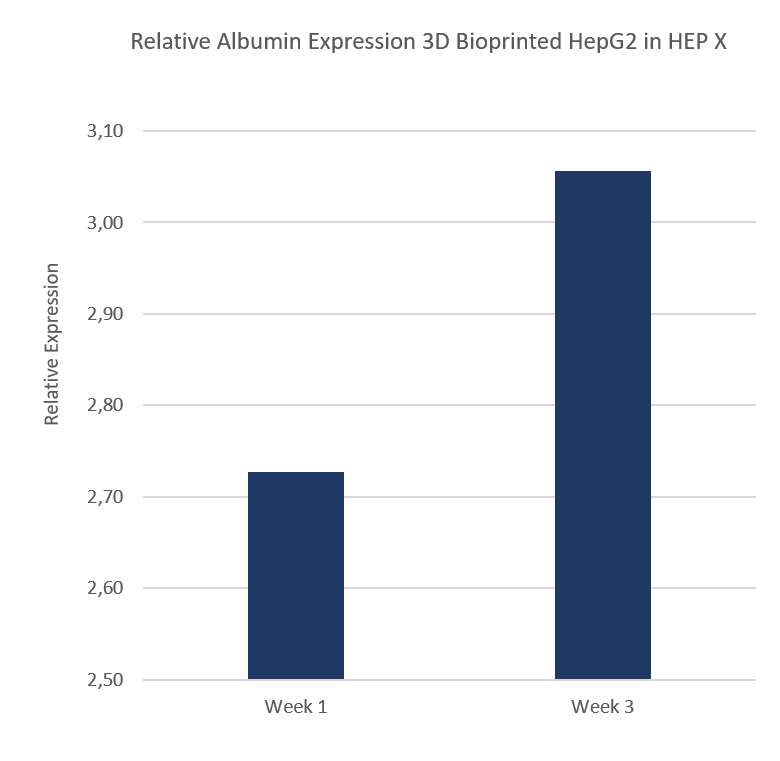 After one week of culture, the albumin expression was increased by 2,7 fold when cultured in the bioprinted construct and at week three the fold increase was above 3 fold. The expression in the figure beside is visualized relative HepG2 in 2D. 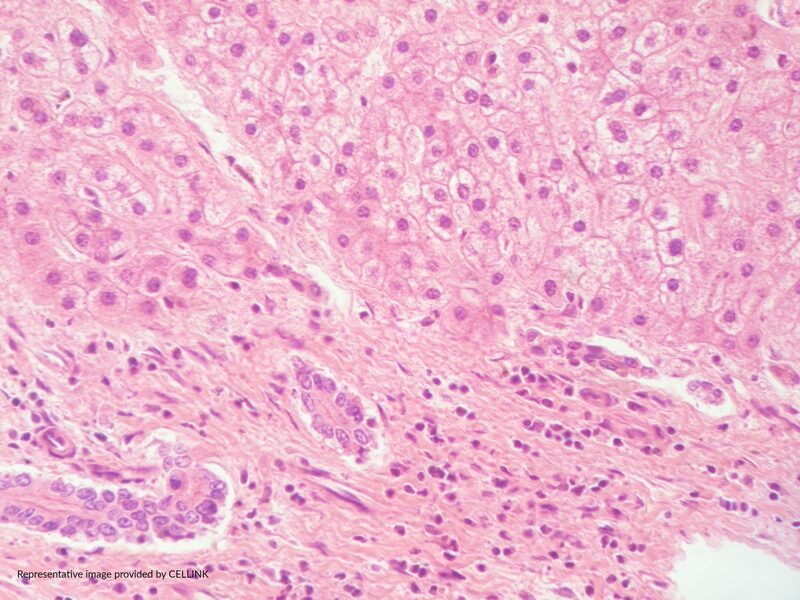 Primary hepatocytes were 3D bioprinted in the HEP X-series bioink containing liver ECM, and cultured for two weeks. The cells were encapsulated within the bioink and display the typical rounded/cuboidal morphology. The image beside display trichrome staining of a bioprinted constructs after two weeks of culture. 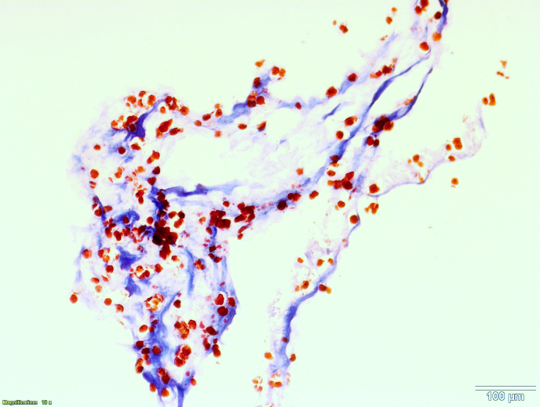 The cells are stained red and the ECM is stained blue. Scale bars 100 µm. Studies on human primary stellate cells are essential for understanding liver matrix production. After 3D bioprinting in HEP X and three weeks in culture, stellate cells within the bioprinted constructs demonstrated migration and proliferation as well as cell-matrix interactions. 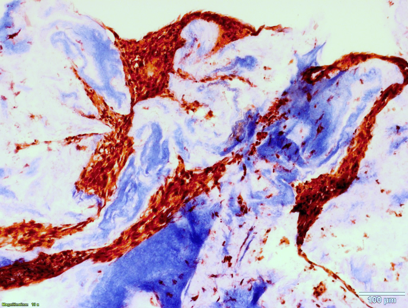 Image beside show histology sections stained with trichrome where human primary stellate cells are stained red and ECM are stained blue. Scale bars 100 µm. In the figure beside, the pro-collagen I production in the 3D bioprinted primary stellate cell constructs were analysed after two weeks of culture with also one week of TGF-β induction. Decellularized ECM does not contain any pro-collagen I which means that all pro-collagen I was produced by the activated stellate cells. 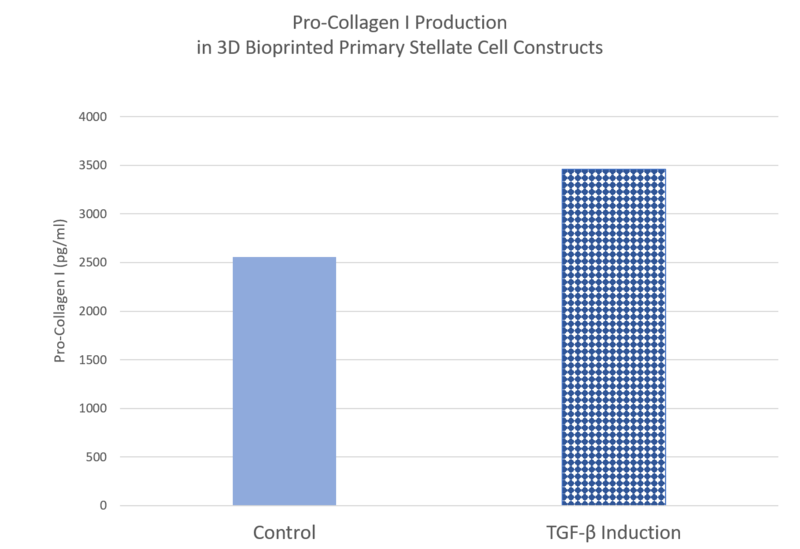 3D bioprinting demonstrate activation of the stellate cells as production of pro-collagen I is exhibited. With TGF-β induction, the production of pro-collagen I is higher than control. At CELLINK, we demonstrate that culture of major liver cell types, such as hepatocytes and stellate cells, can be successfully 3D bioprinted using our liver ECM containing HEP X bioink. Liver ECM components help to mimic the natural liver lobule environment in order to maintain and improve specific cell functions. In addition, HEP X will provide a favourable environment for the use of primary hepatocytes and stellate cells, and non-parenchymal cells as a drug development platform.